Ever played some good old games like Warcraft 2? There are some nice features that could be implemented to Diablo II, as it's the case of a dynamic health bar which changes colour depending on how many hit points the unit has (exactly as the player/hireling/single-pet portraits in the screen). Last edited by Ogodei on Wed Aug 31, 2016 8:30 pm, edited 3 times in total. I don't see anything that call your custom code. I'm not the best codder out there, but diden't you missed anything in the 1st part of the code ? I do like the idea btw. Gj on having this working. Ok I just tested, the custom code is correctly loaded (changing colors there do work) but no matter how many percent life the ennemy have, it always use the green color code to show it. It is like the game consider that it always have more than 80% life and just there no matter what. Any idea what can cause this ? 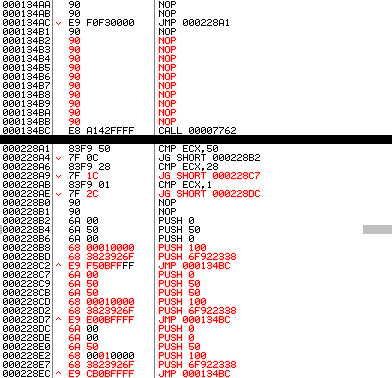 on your screen I see that you noped the JNZ at 6F8AA838, wich is not in the code you posted above so I haven't it noped. Maybe it's that, I will try. Last edited by Xaphan on Wed Aug 31, 2016 8:27 pm, edited 1 time in total. Oh! thanks again . I didn't post it because I saw it as a NOP already. I noped it before attempting to create this code(while playing with the default life bar) updating the 1st post right now! Sorry for resurrecting the old topic, but I thought it'd be better to ask here than creating a new one. I tried to implement all this code to 1.13c version, did everything the same, but I wasn't surprised it didn't work, not to mention 1.13c code slightly differs from 1.10 code. 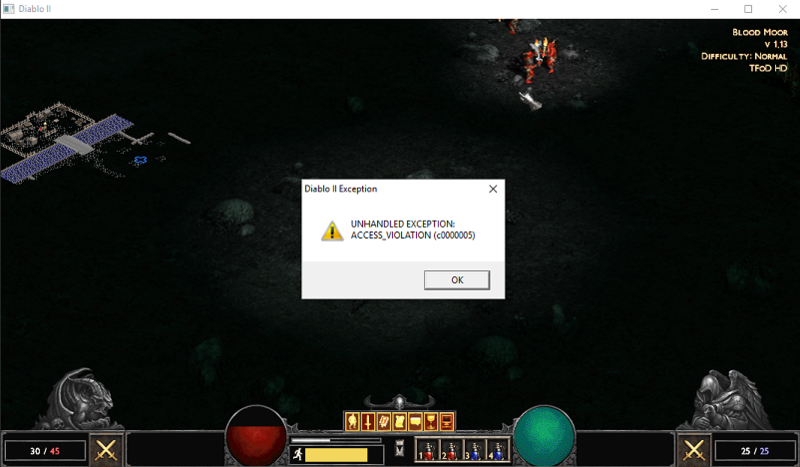 When I move cursor on enemy I get an unhandled error. Looks pretty much the same, but doesn't work. You need to jump back to 000134B7, else you will be missing the global palette param to D2FindPaletteIndexForColor (the call to what was D2Win.#10034 got inlined). You need to check where its crashing, your code now looks correct (and I forgot the PUSH 100, which is the size of the palette you are asking it to search). It crashes when I move cursor over enemy. Maybe it crashes because I use wrong place for custom code, I don't know. 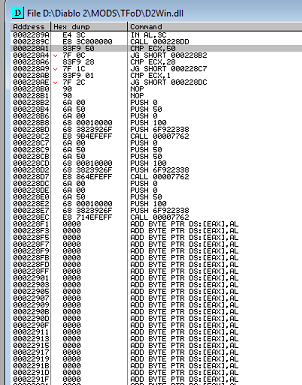 I use the first line from the bottom of D2Win when it starts "ADD BYTE PTR DS:[EAX],AL" up to to end. Edit: I guess you meant to check on which line crash occurs, I feel stupid. You might have to rebase your D2Win.dll to get those long jumps working. If that's the case then you endup with the so called ALSR bug, really it's not ASLR but a reloc issue, where newer windows OS's forces a relocation on a file that expects not to be relocated. I'll can add this cool edit of Ogodei's to next version of BaseMod, with option to use it or not.